Written by Guest post on Wednesday, 17 May 2017. Kefir is a fermented milk drink chock full of probiotic bacteria and yeasts. You can buy it ready made or you can ferment your own. If you’re lucky you may be able to buy it bottled. I searched and found it online at Woolworths but it’s not worth ordering online just for one bottle of Kefir. I did enquire which of their Sydney stores had it but when I rang the ones I was told, they had deleted it from their stock or they just didn’t have any. So it can be hard to buy commercially. The alternative is to make your own, which is what I did. There are heaps of instructions on the net but you need Kefir grains or seeds to start your fermentation. These seem to cost around $20 or you may be able to find someone who is already making it who has some spare they can give you as the grains multiply easily. You can make it in a clean glass mason jar or you can buy a purpose-designed jar with a sieve in the lid, which is what I did. The first time you ferment, the kefir grains can take a while to “wake up”. So once you’ve added some milk to your grains and put the lid on a screw top jar, you can leave it for anywhere between 24 and 48 hours. You’re not supposed to let it sit in direct sunlight so either put it in a dark cupboard or just cover it with a clean tea towel on the countertop. Swirl the contents of the jar occasionally as this helps the fermentation process. Once the contents are thicker, or even separated, it’s ready. If it’s separated just stir it before straining to remove the kefir seeds. You can now do a second fermentation if you wish without the seeds. This is supposed to increase the level of B vitamins and reduce the lactose after 6 – 12 hours (taste from time to time so it doesn’t become too sour) and then keep in the fridge. After sieving, you'll be left with the Kefir seeds in the sieve. They look like tiny florets of cauliflower! Add them to a clean jar and cover with milk and you can store them in the fridge till you're ready to use them again. Change the milk daily. It’s recommended that if you’re not used to taking probiotics that you start slowly with only a tablespoon of kefir per day. If you don’t notice any problems (such as tummy upsets) then you can increase over time until you get to a glass or 250ml per day. It populates your gut with beneficial flora – the good guys – and helps restrict the growth of, and or kill, the bad guys. Beneficial bacteria produce a compound called butyrate which protects against colon cancer. The CSIRO has produced a short video animation of the process which you can view here. In addition, kefir is supposed to promote a healthy immune system. Beneficial bacteria produce a compound called butyrate which protects against colon cancer. The first two batches I made I only used one fermentation. I found the kefir had a pleasant taste, like a mild yoghurt but not as acid. You can use it in smoothies and other recipes. It can also be used to make cheese and as well as in cooking but I’m guessing you’re losing its probiotic power if you cook with it. 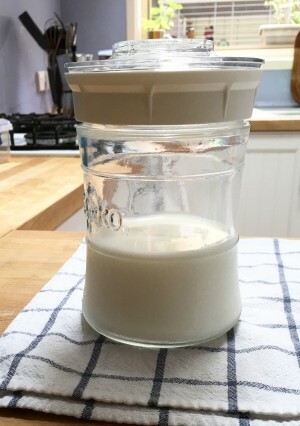 Kefir is cheaper than buying probiotic pills, has a wider range of beneficial bacteria and much less sugar than those yoghurt drinks you buy at the supermarket, and it’s easy to make. Give it a go for yourself. Thanks to Munaiba Khan, a retired naturopath with an interest in nutrition.